Planting citrus is a favorite for backyard farmers, particularly in California where growing conditions produce flavorful fruit – and lots of it. With glossy evergreen leaves and fragrant spring flowers, citrus trees are a handsome addition to any edible landscape. March and April are ideal months for planting citrus. Here are some tips on establishing and caring for new citrus trees. Choose a sunny, frost and wind-free site – southern exposure is best. Warm microclimates are created by reflected heat from walkways or houses. Avoid planting in lawns that get frequent shallow watering. Dig a hole twice as wide as the pot the tree is in and one-and-a-half times its depth. To check drainage, flood the hole with water. The following day, refill the hole with water. Drainage is OK if water drops two inches in two hours. If drainage is poor, plant in a raised bed or container. To plant your tree, tap the side of the citrus tree’s pot to loosen the roots. Gently remove it from the pot and stand it in a bucket of water. It’s best to do this about an hour before you plant it to allow the roots to get a thorough soaking. Begin filling the hole with native soil until you are about the depth of the pot minus 2 inches. Premix the remaining native soil with about one-third organic matter such as compost (and sand if your soil is heavy clay) in a pile or wheelbarrow. You can also add a small amount of manure or blood and bone meal but not too much as there is a risk of burning the roots. Remove the tree from the bucket, tease out its roots with your fingers, and place it in the hole so that the top section sits about 2 inches above the level of the ground, planting the root ball high for future settling. Fill the rest of the hole with the soil/compost/sand mixture to ground level. Use the remaining soil mix to build a several inch-high, circular irrigation berm around the root ball. Make this watering berm or basin no larger than the root ball, or irrigations may wet the soil around the plant but not the root ball. Expand the area as the tree grows. Spread a 2- to 3-inch layer of organic mulch around the base of each citrus tree to help hold in moisture, regulate the soil temperature, and prevent weed germination and growth. To lessen the threat of root rot, spread the organic mulch at least 6 to 12 inches away from the citrus tree’s trunk. This prevents excessive moisture retention around the roots and allows for proper air circulation. Citrus don’t like “wet feet,” but it’s important for the first 12 to 18 months to keep new citrus watered. Don’t drown them, but water as often as necessary to keep the root ball moist. This may mean watering every three or four days at first. As the tree grows, explore the soil with a screwdriver or soil probe to make sure the whole root ball is getting watered. Lengthen the time between irrigations after about nine months to every seven to 14 days. After 18 months, deeply water tree every 10 to 12 days, or as seldom as once or twice a month. Begin fertilizing right away with compost tea or applications of liquid manure or fish emulsion. Citrus trees are shallow rooted, so try not to cultivate the ground under the tree and don’t plant any ground cover near it. Maintain your mulch. More prolific with age, producing better-tasting fruit with maturity, citrus trees reward careful planting, watering, and fertilizing. Here’s to a great start for your trees! 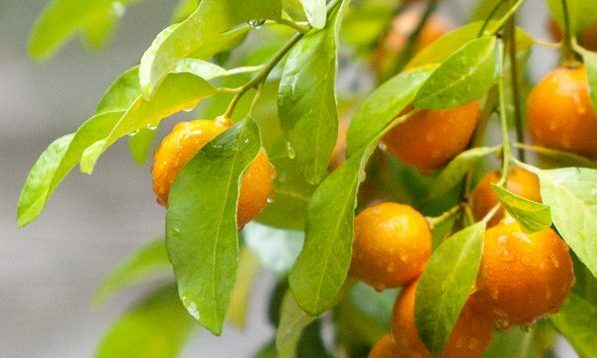 This entry was posted in Grow Your Own and tagged citrus, garden, planting, winter.